+ Last year I contributed to Thomas John Bacon’s piece ‘PERCEPTION:Lab’ which was performed this summer in Boston. I, along with 12 other artists, gave Thomas a sealed envelope containing an action that he would perform for an hour. Each action ‘was designed to stimulate the potential for failure through impossibility or risk’ and on 20 June Thomas opened each envelope in turn and perform it’s action, in an intense piece that lasted 13 hours. Find out more on Thomas John Bacon’s website. My contribution was Action 12. 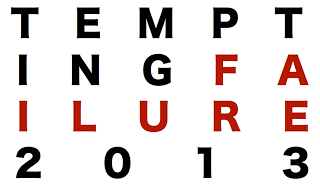 + After performing at Tempting Failure festival in each year it has run, I am very excited to say that this year I have joined the team as an Associate Producer and am looking forward to being able to share more news about Tempting Failure soon. For now check out the new website and like us on Facebook. I will be showing new solo work and collaborating with temp0rary on an ambitious performance that will close the event on Saturday night. On 4th March 2012 I’ll be performing [deletia] as part of Tempting Failure at the Bierkeller Theatre in Bristol Performance Space in Hackney Wick, London. This event is being organised by Thomas John Bacon, and many more details can be found here on his site.